Last Wednesday, September 23, Cameron and I went to the Museum of Flight in Tukwila to see astronaut Gregory J. Johnson. Cameron's been talking about wanting to be a fighter pilot and an astronaut, so I thought it would be good for him to meet one. Johnson gave a fascinating hour-long presentation about his road to becoming an astronaut as well as a detailed account of his Space Shuttle flight STS-125. Johnson was the pilot for this mission to upgrade and repair the Hubble Space Telescope. Long before he was flying the Space Shuttle, Johnson learned to fly in Moses Lake, WA, in seaplanes. He used these skills to fly for Kenmore Air as he attended the University of Washington, where he earned a degree in Aerospace Engineering. After that, Johnson went on to be a naval aviator, with over 500 carrier landings under his belt, and retired with the rank of Captain. He then became a USAF test pilot at Edwards Air Force base. Because the Hubble Space Telescope is in a high orbit, there's a bigger risk of space debris hitting the shuttle on the ascent. Johnson said that the only way NASA would do this mission was if there was another "rescue" shuttle standing by to rescue the crew, which there was. Johnson said that during the ascent, you feel 3 Gs for "a long time." He said it's like someone sitting on your chest. Johnson said that the entire re-entry flight is controlled by autopilot. They switch off the autopilot on final approach, as the computer isn't able to do this part of the flight. Johnson said that they had some alarms on the ascent -- and he thought they were going to lose one of the engines. Due to weather, the shuttle and crew had to stay in orbit a few extra days. On the first extra night, NASA sent up the new Star Trek movie in eight pieces. (He said this was before the film was in theaters.) They set up two laptops with the movie and watched it until they were supposed to go to bed. Johnson said they had to ask Commander Altman (AKA "Dad") if they "could please stay up and watch the rest of Star Trek?" On the second extra night, the crew watched "Apollo 13," which made me wonder if this was a rite of passage for astronauts in orbit. He said it wasn't fun watching a movie about astronauts who were almost marooned. After the presentation, Cameron and I waited to get an autograph from Astronaut Johnson. When it came our turn, Cameron got tongue-tied when Johnson asked his name so I had to speak for him. But he got his autograph, which he's very proud of. 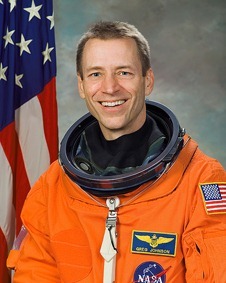 To read more about Gregory C. Johnson, see this pre-flight interview with him on NASA's website.